8 year old neutered male dachshund developed itchy, crusty sores with hair loss and small pustules. Given Simplicef by vet, cleared up, then came back within 2 days of end of prescription. Then put on prednisone and an omega 3 fatty acid. Within 2 days of end of prednisone prescription, sores are back. Sores are in arm pits, chest, along belly, under his tail. Has also been sneezing (currently on Benedryl for allergies--seems to be helping), has bouts of very scaly dry skin all over. It sounds as if your dachshund has an underlying problem that is not being addressed. 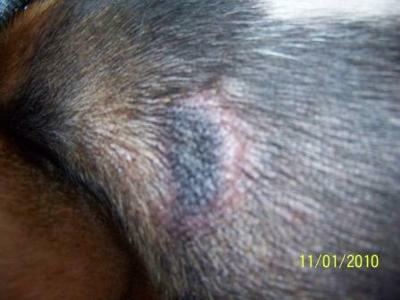 He obviously had a skin infection initially, but these usually develop as a result of something else that is going on. Also, it is possible that the treatment with the antibiotic (Simplicef) was stopped to soon. I usually treat skin infections for three weeks or until the skin looks completely normal, and then another week after that. The list of possible underlying conditions that predispose dogs to skin infections is long: allergies, parasites and hormonal imbalances just to name a few. To get to the bottom of the problem, your dog will need some diagnostic testing. I would recommend a skin scraping to look for mites, a fungal culture to rule out ringworm and skin cytology to look for high numbers of yeast and bacteria to start with. If he still has a bacterial infection of the skin, this will need to be completely eliminated with a longer course of antibiotics while the search for an underlying condition continues.